Community Crops Plant Sale Event May 13th, 2017. Join us for a fantastic selection of vegetable plants, tasty herbs and beautiful perennials. Buying plants is a great way to help support community gardens in Lincoln! Location: Union Plaza, 21st & P Street. Plants sustainably grown by Community Crops at our Greenhouse! Also featuring locally grown plants from Gene Gage (Papa Geno) of Heartland Organics and the Nebraska Statewide Arboretum! If that wasn’t enough, Big Red Worms will be on hand with their amazing compost products! Cash, checks, credit cards are all accepted. SNAP (food stamps) accepted for all food plants. Over 40 varieties of heirloom and hybrid tomatoes. Delicious types of peppers, eggplant, cucumber, squash, melons, and many more vegetables that grow well in Nebraska. Over 30 different varieties of herbs, including basil, oregano, sage, parsley, rosemary, lavender and thyme. Edible perennials such as service berries, elderberries, hazelnuts and more. Special perennials from the Nebraska Statewide Arboretum. All plants are locally & naturally grown! RSVP & invite your friends to the main sale! Enter Wyuka at 36th and O. The Stables are just north of the ponds and easy to find! 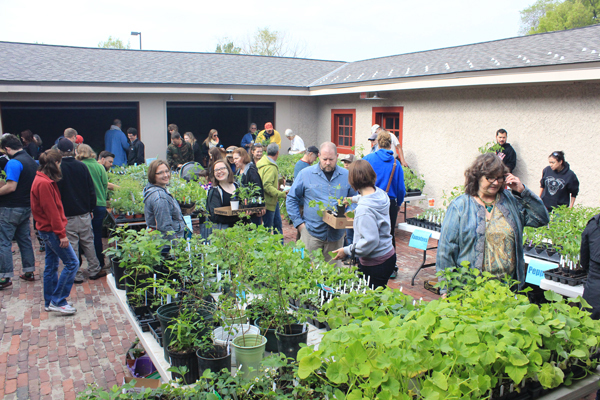 Please contact the Crops office at 402-474-9802 or info@communitycrops.org to learn more about volunteer opportunities at the Plant Sale. The Crops Plant Sale is sponsored by KZUM 89.3 and the Journal Star.